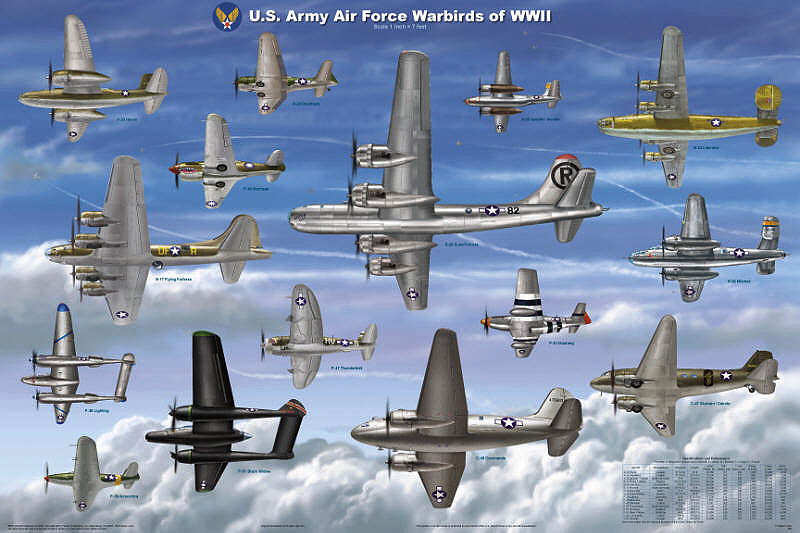 This magnificent poster faithfully presents all the aircraft widely used by the U.S. Army Air Force during World War II. 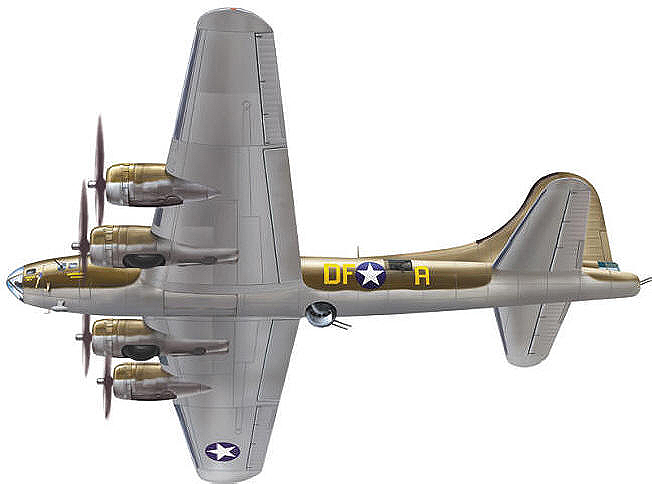 Each has been meticulously researched to provide the best possible representation of the airplane. 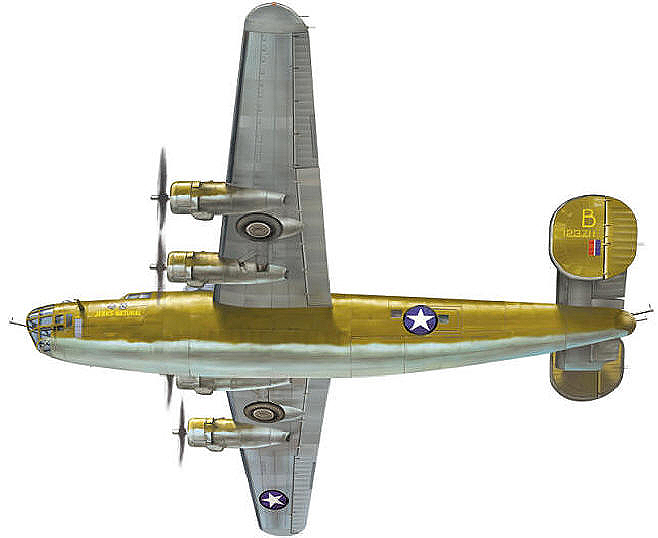 They include the famous B-17 Memphis Belle, the first bomber to complete 25 missions over Germany; Lt. 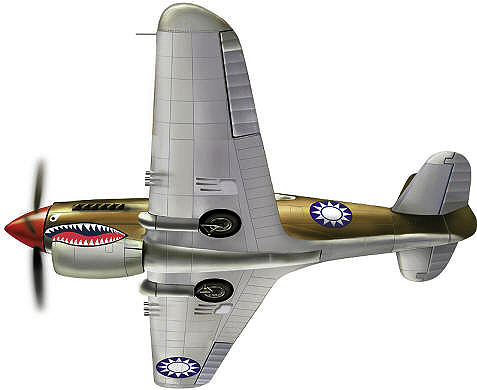 Colonel Jimmy Doolittle’s B-25, which flew off of the aircraft carrier Hornet to bomb Tokyo in one of the most daring raids of the war; a P-40 of the immortal Flying Tigers; and the Enola Gay, the B-29 that dropped the first atomic bomb. Some of the other aircraft are not as well known. The twin-engine P-38 Pudgy was flown by Major Thomas B. McGuire. He was the top American ace of WWII. He shot down 38 enemy aircraft in the Pacific Theater. Colonel Francis “Gabby” Gabreski was the top ace in the European Theater. 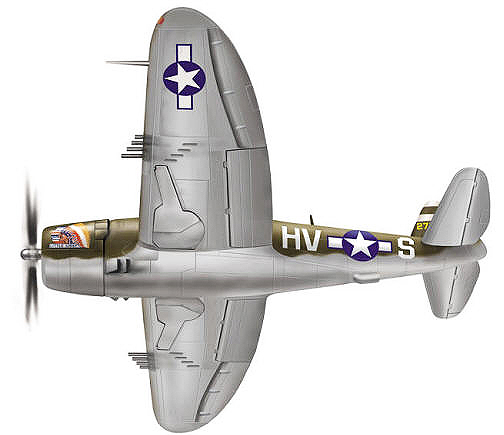 Flying a P-47 Thunderbolt, he was credited with 34 kills. The C-46 Commando and C-47 Skytrain were cargo planes, but they were used extensively to drop paratroopers during invasions and other offensive operations; they constantly airlifted supplies to front line fighting troops. Because of such use, many authorities consider them warbirds. 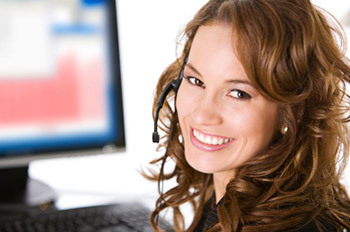 Aircraft are usually shown in profile, as the images are relatively easy to prepare and are more compact. This permits more to be shown in limited space. The P-38 Lighting had twin booms, and the B-47 Stratojet introduced swept back wings and nacelle hung engines, the design used by almost all future airliners. These important body and wing designs cannot be shown in profile views. To overcome this, Feenixx introduces an exciting new approach to aircraft presentation. Each military aircraft title focuses on a specific subject, and shows all of the appropriate aircraft. They are presented in perspective, all from the same low angle using the same directional lighting. They are also sized to the same scale. 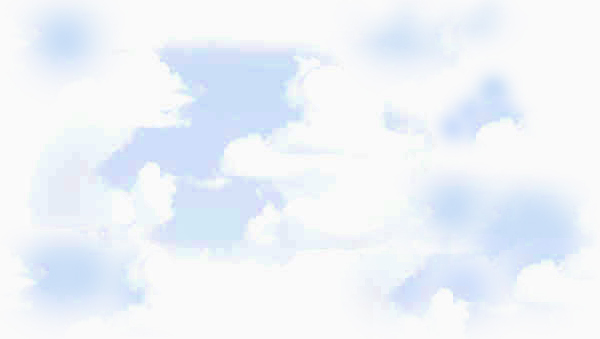 When superimposed over a common sky background, it creates the illusion that they are flying overhead in formation. This makes it very easy to visually compare their size and design. These posters also contain a highly detailed chart citing the specifications and performance characteristics of each aircraft, making them easy to compare.